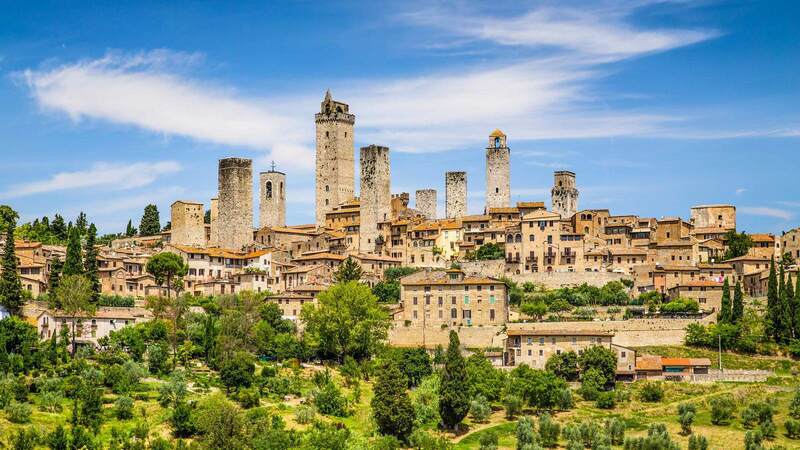 San Gimignano, town of the medieval Towers. 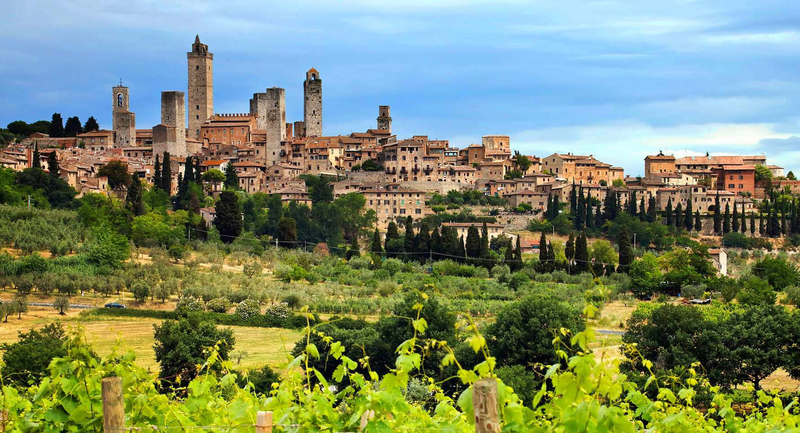 Soaring on a hilltop overlooking Valdelsa, in a territory most certainly inhabited in Etruscan times, the town is an outstanding testimonial to medieval Tuscan urban planning. It was already an important market centre in the 10C, at the crossroads of important routes. In the 13C it boasted nine “hospitatores” for foreign merchants, and the 72 towers were a clear expression of the city’s prosperity. 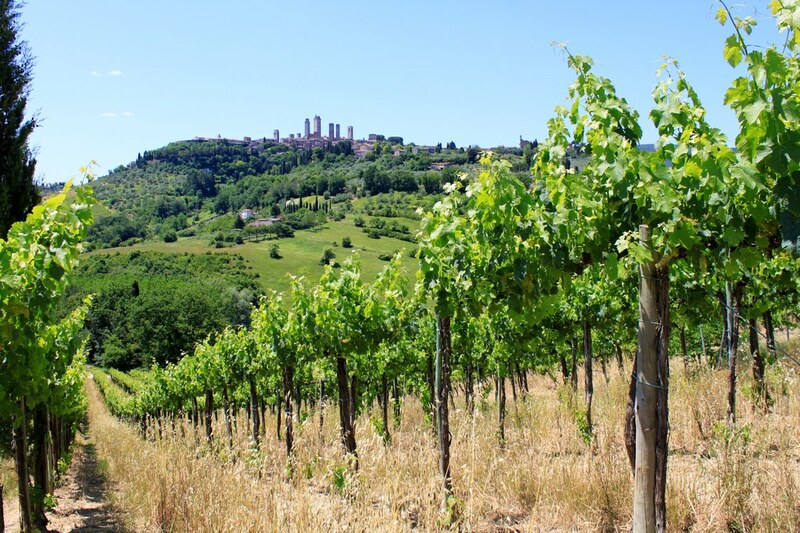 Then the new layout of the Frankigen Way, and the ensuing development of Poggibonsi and Colle, gradually brought about economic decline, a circumstance which has certainly favoured the perfect preservation of a typical Tuscan medieval commune. Still encircled by its medieval walls, the town is entered through the 13C San Giovanni Gateaway with a characteristic Sienese segmental arch. Via San Giovanni, one of the most famous, is lined by many 13-14C dwellings, and the remains of the façade of the Church of San Francesco. Pratellesi Palace houses the Civic Library with its treasure of over 10.000 manuscripts. Further on, we come to the Cugnanesi Tower and the Becci Archway, flanked by the Duecento Becci Tower. In Via Quercecchio is the Oratorio of San Francesco with an Ornithological Museum. A series of stairways leads up to the Fortress of Montestaffoli (1353), dismantled by Cosimo I in 1558. From its sole surviving tower is a superb view of the city. Piazza della Cisterna is connected through a passage way to Piazza del Duomo with which, since the 13C, it has formed the city core. Piazza del Duomo is overlooked by the Palazzo del Podestà and dominated by the mighty Torre della Rognosa, adjacent are the Chigi Tower and the twin Salvucci Towers. Above a high flights of steps rises the Collegiate Chapter, a 12C Romanesque building which interior contains works by Taddei di Bartolo, Benozzo Gozzoli, Jacopo della Quercia, Bartolo di Fredi; in the Chapel of Santa Fina we find frescoes by Domenico del Ghirlandaio and one of the most outstanding Renaissance masterpieces, an altar-front by Benedetto da Maiano; to the left of the Chapter Church is the Palazzo del Popolo, dominated by the massive Torre Grossa, which houses the Civic Museum with paintings of the Tuscan School (13-15C) and a collection of ceramics; in the magnificent Dante Council Chamber is a “Maestà” by Lippo Memmi; in the Trecento courtyard stands a cistern of 1361 and under the loggia is a fresco by Sodoma. 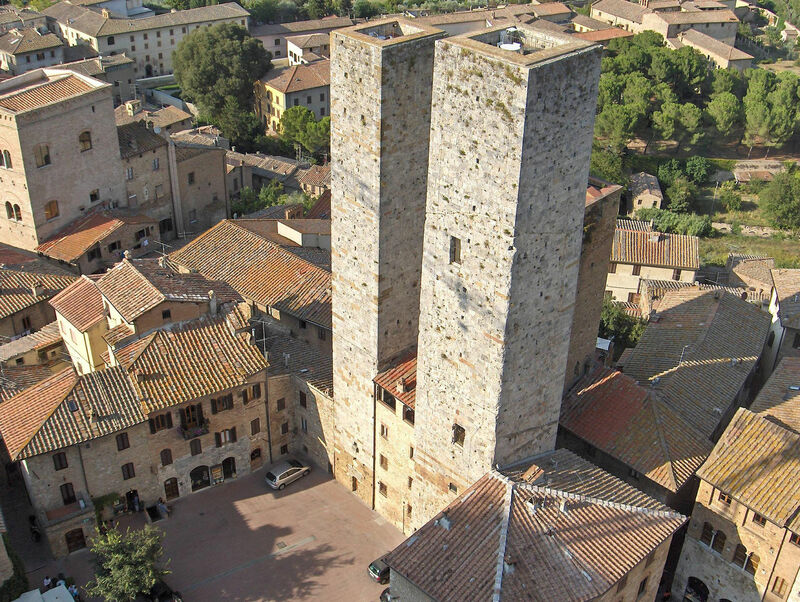 Via San Matteo, the northern stretch of the Frankigen Way, is flanked by medieval dwellings and mansions: the Pettini Palace and Tower, the Cancelleria Palace and Archway, the Church of San Bartolo, the Pesciolini Tower-House, Palazzo Tinacci… In Piazza Sant’Agostino, besides the small Romanesque Church of San Pietro, rises the Church of Sant’Agostino, an imposing Romanesque-Gothic construction (1280-98). 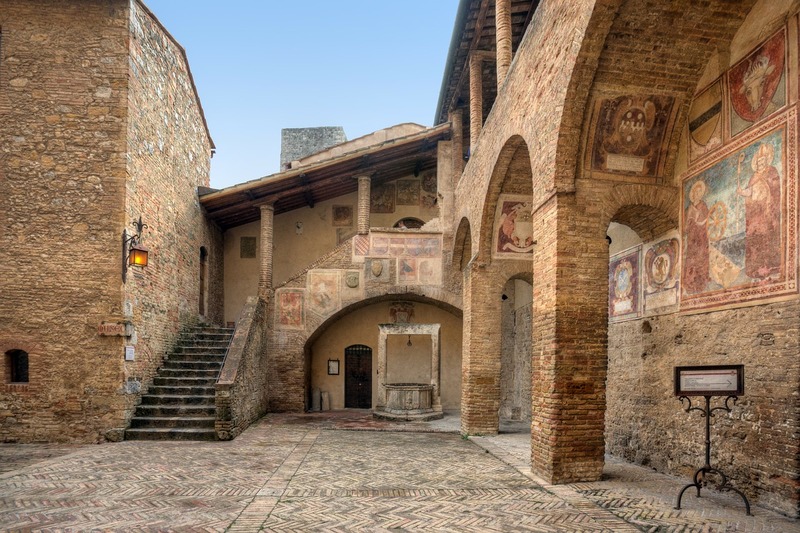 Worthy of note are the 13C Hospital of Santa Fina, still in use, and the Duecento Church of San Jacopo from which, following the enceinte of walls on foot, the fountains are reached, covered by Gothic Arches (12-14C). 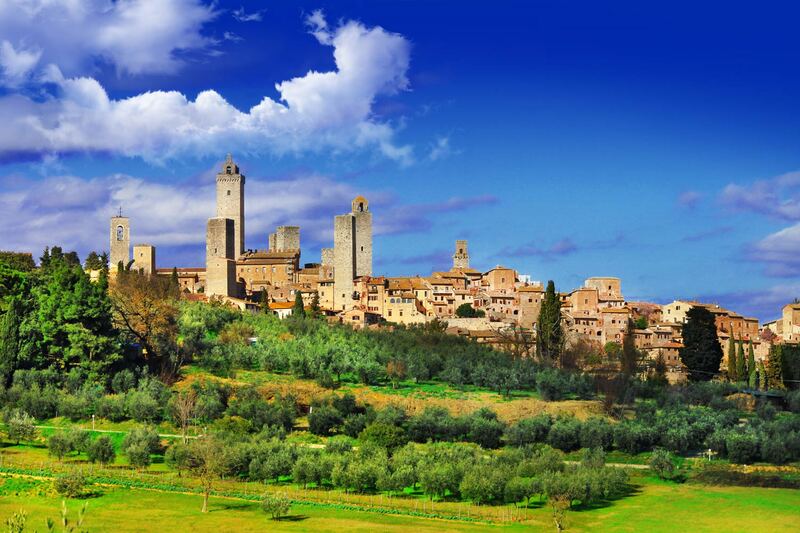 Tuscany and all its treasures are waiting for you, book an unforgettable stay in one of our villas!